Egyptian striker Mohamed Salah has been named as the Professional Footballers’ Association Player of the year for the 2017-2018 season. Salah Sunday beat Manchester City’s Kevin De Bruyne although Belgium won the Premier League title with his club. The Egyptian international has scored 41 goals since joining Liverpool this season. He still leads the Premier League top scorers’ table with 31 goals in 33 Premier League appearances. He also made his teammates score with nine assists. “It’s an honor and especially as it’s voted by the players. 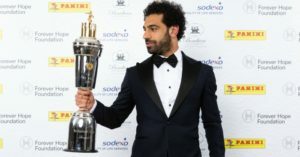 I am happy and proud,” Salah said on winning the award. The Egyptian star who was behind his country’s qualification for the Russian 2018 football World cup also received this season BBC African Footballer of the Year Award. The 25-year old player has stunned fans and former teammates for his excellent performance at Anfield Road. Former teammate and Roma Legend Francesco Totti told Liverpool official website that he was shocked by Salah’s performance. “To some extent, it surprises me that [Salah] has been doing so well in his first season at Liverpool,” Totti said. Salah moved from Roma to Liverpool after a short spell (2014-15) at Chelsea. Liverpool are hosting Tuesday Roma for the first leg of the European Champions League Semifinal. Salah became the first Egyptian to win the Professional Footballers’ Association Player title. The Liverpool dangerman is taking over from Algerian and Leicester City star Riyad Mahrez who won the award for 201-2017 season. Written by: KanelkaTagba on April 24, 2018. Posted by KanelkaTagba on Apr 24 2018. Filed under Headlines, World News. You can follow any responses to this entry through the RSS 2.0. Both comments and pings are currently closed.